Senior Isabella Regalado announced Tuesday her decision to play basketball for Northeastern State University in Tahlequah, Oklahoma. The RiverHawks went 10-17 last season under first-year Head Coach Fala Bullock, a four-win improvement over the prior year. NSU competes at the NCAA Division II level in the Mid-America Intercollegiate Athletics Association. Regalado averaged 9.27 points per game with a 31% field goal percentage and 69% free throw average. 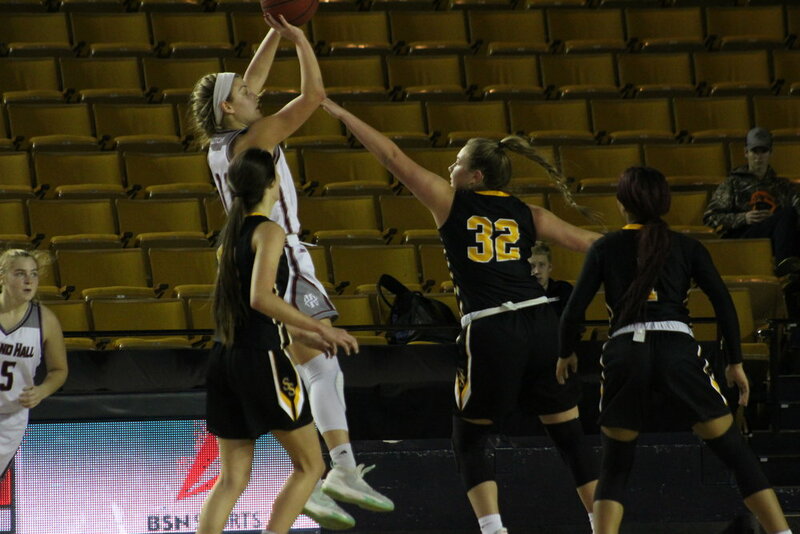 She collected 4.75 rebounds per game, led her team in scoring on three occasions, and scored a career-high 23 points against Jenks. The Lady Sandites went 18-8 last season, placed third in the Frontier Valley Conference, and made it to the State Tournament Quarterfinals. Senior Destiny Johnson has committed play basketball to the University of Tulsa. The Hurricane is coming off a 10-21 season under eighth-year Head Coach Matilda Mossman and competes in the NCAA Division I in the American Athletic Conference. Johnson was the number-two scorer on her team with a 16.28 average, 48.06% field goal percentage, and 65.73% free throw percentage. She recorded 5.65 rebounds, 1.5 assists, and two steals per game with three double-doubles. She led her team on ten occasions and scored a career-high 31 points against Ponca City. Senior Holly Kersgieter previously committed to the University of Kansas last year. The Jayhawks went 12-18 in the NCAA Division I, competing in the Big 12 Conference under third-year Head Coach Brandon Schneider. Kersgieter led her team with 18.12 points, 7.33 rebounds, 1.2 assists, and 2.5 steals per game, shooting 49.65% on field goals and 73.1% on free throws. She recorded four double-doubles, led her team on sixteen occasions, and scored a career-high 29 points against Union. Seniors Tyler Ash and John Miller recently announced their intent to play baseball for Eastern Oklahoma State College in Wilburton. The Mountaineers went 44-17 in the 2017-2018 season, competing in the NJCAA Region II. They are coached by Matt Parker in his first year after moving over from Oklahoma Wesleyan University. Sandite Baseball finished the 2018 season with a 24-12 record under first-year Head Coach James Garrison, falling in the Regional Championship finals. Ash amassed a 3-2 record on the mound with a 3.77 ERA and 1.45 WHIP in 26 innings. He recorded a .266 batting average, .376 slugging average, and .412 OBP with 29 hits, 27 runs, 25 RBI, two home runs, and eighteen stolen bases. Miller pitched a 5-1 record with a 2.13 ERA and 1.1 WHIP in 26 innings. He batted .385 with a .462 slugging average, and .467 OBP for two runs, five hits, and four RBI. Senior Cale Savage has committed to play baseball for Northern Oklahoma College in Enid. The 2018 season was the best in Jet history with a 48-16 record and third place finish in the NJCAA Division II World Series. They are coached by program founder Raydon Leaton in his seventeenth season. Savage batted .289 with a .434 slugging average and .406 OBP last season. He recorded fourteen runs, 24 hits, 21 RBI, and nine steals. He also pitched a 2.8 ERA and 1.8 WHIP in five innings. Senior Cal Watkins committed Monday to Seminole State College in Seminole, Oklahoma. The Trojans went 41-12 last season and will be starting fresh this year under first-year Head Coach Mack Chambers. They compete in the NJCAA Region 2. Watkins batted .339 last season with a .393 slugging average and .419 OBP. He recorded 32 runs, 38 hits, fifteen RBI, and seventeen steals. Senior Jacie Taber recently de-committed from the University of Northern Iowa softball team. Taber went 16-3 on the mound last season with a 2.04 ERA and 1.358 WHIP. She batted .368 with a .471 slugging average and .385 OBP for fourteen runs, 32 hits, 32 RBI and one home run. Senior Kimi Presnell is committed to Rogers State University in Claremore, Oklahoma. The Hillcats finished the 2018 season 39-20 under fourth-year Head Coach Andrea Vaughan. They are an NCAA Division II team competing in the Heartland Conference. Presnell is the leading hitter for the Lady Sandites, batting .522 with a .761 slugging average and .532 OBP. She recorded 32 runs, 48 hits, sixteen RBI, one home run, and twelve stolen bases last season. Senior Cameron Clemons is committed to Southern Arkansas University in Magnolia. The Muleriders went 60-11 last season under fourth-year Head Coach Jason Anderson, competing at the NCAA Division II level in the Great American Conference. Clemons batted .271 in 2017 with a .386 slugging average and .326 OBP. She posted twenty runs, nineteen hits, thirteen RBI, and one home run. Senior Madelyn Blair committed last month to the University of Science and Arts of Oklahoma in Chickasha. The Drovers compete in the NAIA and Sooner Athletic Conference and are coming off a 57-5 season and NAIA World Series Championship under fifth-year Head Coach Jadyn Wallis. Blair amassed a 6-3 record on the mound last season with a 2.96 ERA and 1.5 WHIP in 52 innings. She holds a .365 batting average, .469 slugging average, and .398 OBP with twelve runs, 35 hits, and 22 RBI. Senior Elizabeth Luttrell has committed to Cowley County Community College in Arkansas City, Kansas. The Tigers compete in the NJCAA and are coming off a 42-16 season and National Tournament appearance under second-year Head Coach Jenny Hoyt. Luttrell holds a .357 batting average, .536 slugging average, and .409 OBP with 22 runs, thirty hits, three home runs, and 29 RBI in the 2017 season. Lady Sandite Softball went 23-8 last fall and has made the State Tournament three consecutive years.